Pride was this past weekend and Sweet Tea and I decided to celebrate with our church. 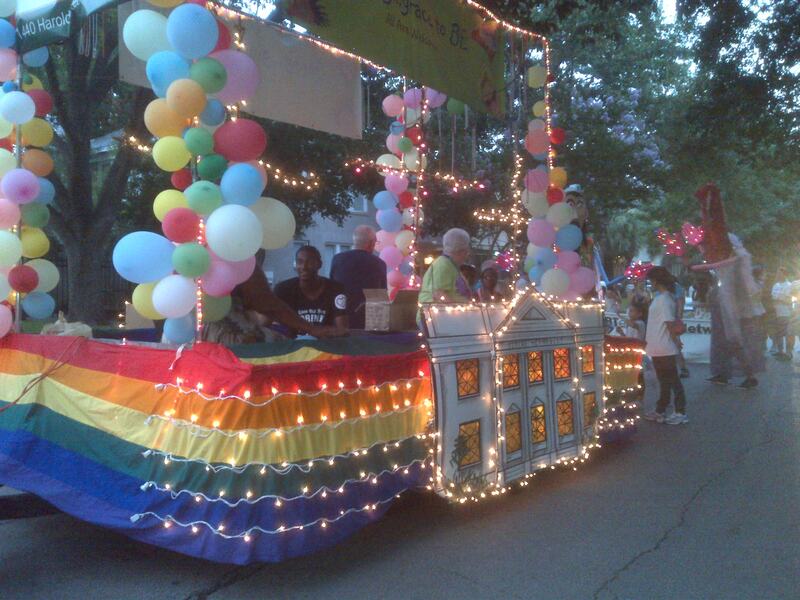 A couple of months ago we agreed to help some friends of ours with the church’s float. Those friends ended up needing to drop out of the process and a new-to-the-church guy stepped up to lead the group at the last minute. 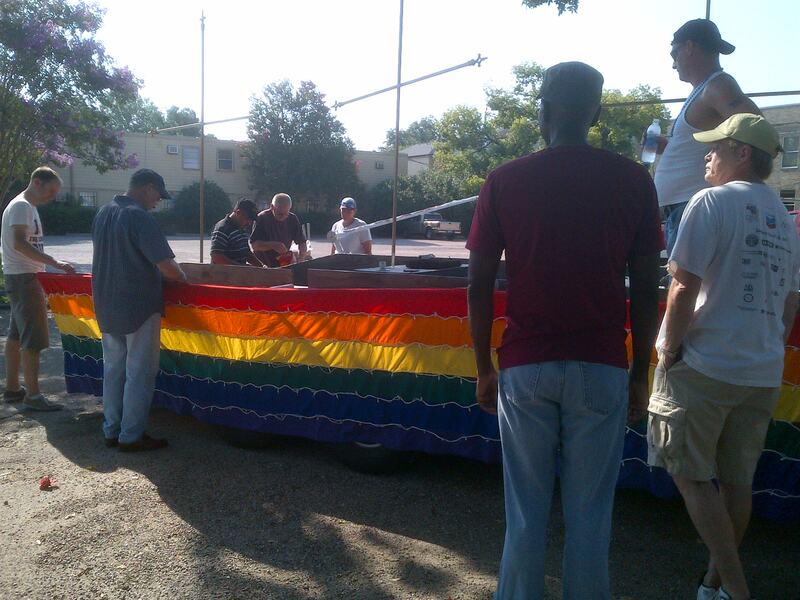 We met Saturday morning to piece together the float. It was a hodgepodge of banners, balloons, lights, and crosses, but considering we were all new to the float making process, I think we pulled it together well. Sweet Tea and I were assigned positions in the marching configuration. I was a “wheel watcher” which just meant I walked next to the truck making sure nobody got too close to the wheels as we traveled. Sweet Tea walked in back with a bottle of water to help keep a puppeteer hydrated. She also had beads to hand out. The parade got underway and we did our thing. I was surprised at how many people there were. I was surprised at how loud all those people were. I was surprised at how much those screaming people smelled like beer. As I smiled and waved I saw all sorts of people. Older heterosexual couples out supporting the cause. Young families with two dads or two moms or the traditional mom and dad waving flags and enjoying rainbow sno-cones. People of every age and stage were there to support the idea of equal rights for every glbt person and to celebrate with us. There were a few that got to me though. One girl who looked to be in her mid-twenties reached out and grabbed my hand and shook it saying thank you. At first I wondered why she was thanking me. I hadn’t given her any beads or done anything to get her attention. Then I realized I was representing my church and christianity. I was saying that she was welcome to come, and we would love and accept her…no exceptions. And she was thanking me for it. It was powerful. Another woman stopped me and gave me a hug. She didn’t say anything, but she had that look on her face. The look that said thank you for accepting me for who I am. I’m not sure if she was a male to female transgendered woman or just a man dressed in drag for the occasion, but either way it was moving for me. The parade wound through the streets of Montrose and our part was eventually done. We were exhausted from being on our feet all day. Back at the church Sweet Tea and I helped undo our handiwork and finally took the long drive back home. We were too tired to go out afterwards and celebrate with the masses. I knew 2 years ago when I saw christian churches marching in the pride parade I would be okay. I saw evidence that it was possible to be gay and be a christian. I saw a group that I could belong to and be accepted by. I am so glad I got to be a part of the celebration with such a great group of people! I look forward to doing it all again next year! It’s really awesome that you have found an accepting church. I used to think I’d go back, someday, but I think it’s going to be a really long time. Just going to my sister’s ordination was about as much as I could handle. I stumbled upon this on twitter. Thank you.